More marketing companies than ever before have in-house agencies to build brand strategies and brand creatives (traditional and digital). In fact, according to a new ANA report, The Continued Rise of the In-House Agency, 78% of client-side marketers report having an in-house agency, a sharp increase compared to 58% in 2013 and 42% in 2008. Growth of in-house agencies is recent with 44% of respondents reporting their in-house agency was established within the past five years. Eight in 10 marketers (79%) are highly satisfied with their in-house agencies. A full 20% are completely satisfied. 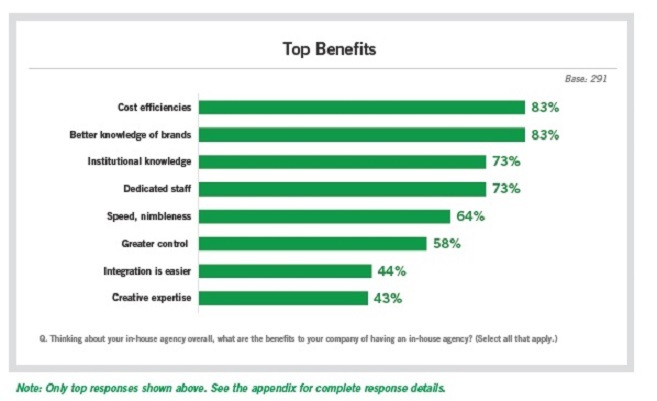 In-house agencies provide many benefits, with “cost efficiencies” and “having better knowledge of brands” ranking top. “Institutional knowledge” and “dedicated staff” rank second highest as benefits. 36% of companies say they are bringing media strategy and planning functions in-house, compared to 22% in 2013. 30% of respondents have in-house programmatic capabilities. 79% of respondents have in-house video production capabilities. The biggest challenge for in-house agencies is managing growth, managing workflow and scaling and managing resources. Importantly, in-house agencies must remember to step outside the box and include an outside perspective of the brand. Strategy: confidentiality, better knowledge of brands and institutional knowledge. Creative/tradition media: creative expertise, less talent turnover and dedicated staff. Creative/digital media: speed, nimbleness, integration is easier and creative expertise. Media Planning/buying: cost savings/efficiencies, full ownership of marketing data and greater control. Despite the growth of in-house agencies, marketers still work with external agencies. In fact, nine in 10 respondents report working with an outside agency. Nevertheless, marketers continue to invest and develop their expertise because in-house agencies allow them to build infrastructures that help weed out inefficiencies.